H.L. Mencken assembled and published Menckeniana: A Schimflexicon, in which he collected all the abuse of his writing that he could find, mostly from newspaper reviews of his books. I have set myself a much easier but less amusing task of collecting between two covers (the beginning and the ending of this blog post) all the abuse of high-rises heaped on that building type by J.G. Ballard in his novel High-Rise, published in 1975. He plots the degeneration into violence of the owners of what we now call condominiums in a new high-rise with balconies near London. The author is known for his science fiction, but while I found the plot intriguing, Ballard did not do a very good job of building up his rising levels of violence in plausible sequentiality. The flow of action was disconnected. His focus on three main characters was unfocused. His protagonists were not very likeable and I did not form any sort of connection with any of them. I was not sorry to get to the end of the book and, not surprisingly, the conclusion seemed anticlimactic. “The ragged skyline of the city [viewed from the highrise] resembled the disturbed encephalograph of an unresolved mental crisis.” Okay, that’s a critique not of the highrise itself but of London – the London of 1975, not of today! Anne was the architect Royal’s wife, who has decided they must move out. Fortunately for the rest of us, humans seem to fitted themselves more reasonably into tower life. 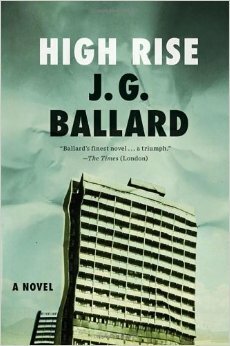 Here is a review, a little too in-depth regarding the characters and their fate for my taste, but those who want to wallow in High-Rise can do so with “Reconstructing High-Rise,” by Rick McGrath, a Ballard fan, written in 2004. I’ve never lived in a building of more than seven stories (the Smith Building in downtown Providence). I don’t think a book, fictional or otherwise, could be written about the psychosis of its residents’ lifestyles. But then, while I lived there for 11 years, from 1999-2010, including, toward the end, three years with a wife and a year with a child, I moved out five years ago and who knows what has happened to life there since. On the other hand, I often hanker to return. This entry was posted in Architects, Architecture, Art and design, Books and Culture, Urbanism and planning and tagged Fiction, H.L. Mencken, High-Rise, J.G. Ballard, London, Psychology, Urbanism. Bookmark the permalink. Did not know. Will check it out. Thanks for the head’s up!! !